“Slight” is the best word to describe the 1983 Pygmalion-esque dramedy, Educating Rita. It is a small film, made on a meager budget, based on a play for two actors on a single set. Yet despite all of its smallness, the film went on to garner three Academy Award nominations. That is because the one thing in Educating Rita that is not small is the considerable charm of its lead actors. In her first motion picture, Julie Walters reprises her stage role as Susan White, a working-class Liverpool hairdresser who seeks to better herself through the tutelage of a burned-out, alcoholic literature professor (Michael Caine). When Susan enters the professor’s life, he has taken to getting plastered off the booze bottles hidden behind the volumes in his bookcase and showing up drunk for his lectures. Through the enthusiasm that Susan (or “Rita” as she initially calls herself) shows for literature, the professor begins to regain some of his love for teaching (while never abandoning his even greater love of the bottle). 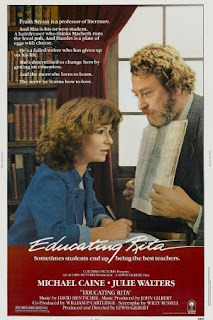 However, when Susan begins to blossom through the professor’s mentoring, both the teacher and student find their new world views a little difficult to endure. Willy Russell adapted his own play in bringing Educating Rita to the screen, and it is a mixed blessing. The scenes between Caine and Walters in the professor’s office lose none of the lively, fresh interplay from the stage version. Unfortunately, the scenes set outside of the original confines of the play smack of theater-to-screen padding. The secondary characters, who are only mentioned in the play, are given life in the film, but they only exist to react to Caine or Walters. These side characters are simply caricatures--a writer’s idea of what stuffy university types and uneducated, working-class mopes are like--rather than creations of flesh and blood. The film has a few other strikes against it. The author has a tendency to repeat his favorite jokes ad nauseum (enough with the “assonance” line already), and his central metaphor that “there must be better songs to sing” is cringe-inducing. While the script has its failings, it is a small liability in comparison with the truly god-awful synthesized soundtrack with which the movie has been saddled. 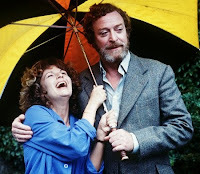 On the positive side, you have the two lead performances of Julie Walters and Michael Caine; and they are nearly good enough to make you forget the film’s flaws. Walters has the meatier part, in that her character evolves in attitude, manners, voice, and carriage as the film progresses. She is fully up to the challenge. The actress sparkles in her first film role; and despite her cinematic inexperience, her performance is never too broad or theatrical for the camera. Caine is equally good as the alky academic, pulling off sloshed sullenness and woozy giddiness with equal aplomb. His potted professor is one of the most memorable of cinema souses. For the lead performances alone, Educating Rita is worth a view. 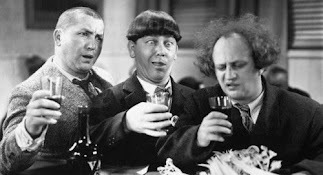 Potent Quotables--BRIAN: Frank, I wanted to mention this before we dine. It’s slightly embarrassing, but, uh, thing is, there’s been a bit of a complaint. BRIAN: Yes. Well, apparently you were a little… drunk at your tutorial today. FRANK: No. I was a lot drunk. BRIAN: Oh, Frank. Why do you do it? When you’ve got--well, well, what haven’t you got? FRANK: A drink at the moment. Similarly Sauced Cinema--For another alky mentor and protégée story, check out What Price Hollywood? (1932). I usually stay away from off topic posts. However, I once attended a bullfight in Madrid (I didn't have a choice in the matter), and it was the most disgusting thing I ever experienced. 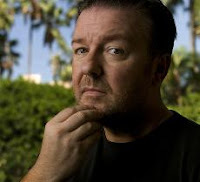 Consequently, when I heard that Ricky Gervais had teamed with the World Society for the Protection of Animals to call for a end of this barbaric tradition, I felt obligated to pass along the news. The people of Catalonia, one of the largest regions in Spain, have gather 180,000 signatures to force their Parliament to vote on a proposal to end the practice of bullfighting. While this is a Catalonian issue, and outsiders opinions are not officially recognized, it is important for their Parliament to know that the world at large supports the Catalonian people in their efforts to end the unnecessary suffering of animals. 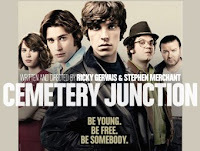 You can sign a petition to show your support at the following link: Time to say "Enough is enough"
I also read today that Ricky Gervais' new film, Cemetery Junction, will not be receiving a U.S. theatrical release. Bummer. 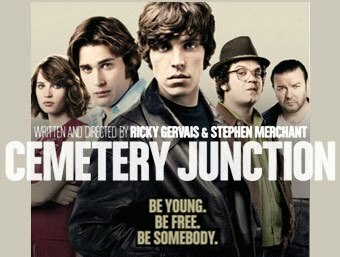 This well-reviewed, coming-of-age dramedy, written and directed by Gervais and Stephen Merchant, was one of the films I was most looking forward to seeing this year. American audiences will have to be content with a DVD and Blu-ray release on August 17th. While I have your ear, let me apologize for the dearth of reviews lately. Preparing for my presentation at Tales of the Cocktail has been eating up the time I normally devote to the site. I'll try to post a new review next weekend.